Tides for Sandy Hook High @ 0116 (4.0 ft.), 1351 (4.6 ft.); Low @ 0705h (1.1 ft.) & 2014h (1.4 ft.); Currents in Sandy Hook Channel Ebb: 0447h (1.2 kts. ), 1739h (1.2 kts. ); Flood: 1059h (1.7 kts.) & 2324h (1.1 kts. ); weather from Sandy Hook to Fire Island AM: E winds 10-15 kts., seas 3-4 ft., PM: NE winds 15-20 kts., seas 4-7 feet; AM/PM Rain. Today is the day I drive the NOAA Ship THOMAS JEFFERSON. I am also scheduled to be on one of the launches. But once again the sky is gray and the sea choppy. Given what happened the previous bad weather days, I doubt if the launches will go out today. At least the ship will head out on its housekeeping voyage – 12 miles offshore to dump the “wet” trash. For some unexplained reason, I rose early and went down to the stationary bike for 20 minutes. Then I showered and ate. As expected, today’s launch schedule was canceled during breakfast. And tomorrow’s launch schedule doesn’t look good either. At 0800h I could hear The CO and Ensign Guberski prepping the ship to get us underway. Engines warming, anchor chain clanging, and hull shuddering. 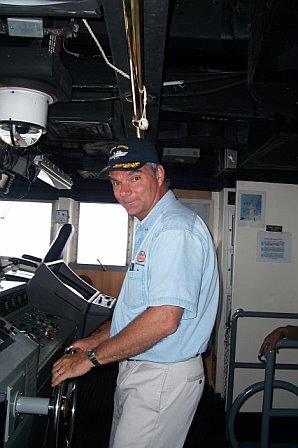 At 0900h I made my way to the bridge where CO Schattgen was the Deck Officer, Ensign Megan Guberski was at the “Conn”, Ensign Andrew Ostapenko was navigating, Anthony was Helmsman, Tom was changing the engine speed on command, and Electrical Engineer Eric was there just in case. Our outgoing course to get to the shipping channel was a bit tricky, so the CO told me I would take the wheel once the ship began a straight (and safe) course. I was very OK with that. 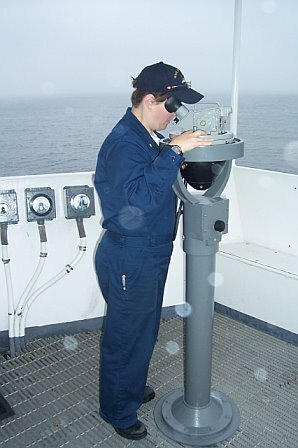 In the mean time, I observed the dynamics of the bridge: the CO was obviously in charge, the Conn (or controlling officer) was shouting out driving orders, the helmsman would repeat the command to make sure he heard it correctly, the navigator was giving advice to the Conn and charting the course, and everyone kept their eyes open. It went something like this: CO: “We need to go a little right.” Conn: “Right five degrees rudder” Helmsman: “Right five degrees rudder, aye” And when the rudder had moved its five degrees the Helmsman would say: “Rudder five degrees right.” The Conn would reply in an acknowledging way. Then you’d hear the Conn say: “Increase to ten.” Helmsman: “Increase to ten, aye.” Followed by “Rudder at ten right.” And so on. It was another classic example of teamwork and coordination. I was at the helm for about 90 minutes. We went straight out Sandy Hook Channel, past the channel buoys, and out into the open ocean. Anthony was watching over my shoulder the entire time, and he was a great teacher. He let me make a few small mistakes and corrected me when my mistakes threatened to get larger. All in all, I thought I did a pretty good job in a choppy sea with a good wind. I was relieved as helmsman at 1145h by Mark. I quickly went down to my stateroom and took another Dramamine. The ship was rockin’ and rollin’ and I needed a little preventative maintenance. I am a firm believer in fixing things before they break. Lunch was great, and then I took a little nap. On our way back to New York Harbor we picked up Bob Schwartz who will be taking video footage for a new NOAA Corp recruitment video. Never a dull moment! He will also take a little footage of me as Teacher At Sea. This evening I watched sunset (what little there was), called Roxann, and spent 20 minutes on the stationary bike. I was in bed by 2130h reading a new book; “White Fang” by Jack London.